Much is being made of the ability of artificial intelligence (AI) to significantly transform Human Resources. But, contrary to many fears, this doesn’t mean removing the ‘human’ aspect of human resources. Quite the opposite. Currently, there’s a reluctance from companies to admit that they are using this type of technology to automate the recruitment process. And we can understand why. There is a strong societal desire not to lose human interaction, so mentions of auto-screening or machine-learning software that enables firms to shortlist candidates without having to set eyes on a CV, can fill some with a sense of dread. But imagine, for a moment, what the sweet spot in HR automation might look like: a place where data intelligence not only frees the HR professional but can be used as evidence to support the ‘gut feel’ and reinforce the importance of human interaction. That’s where truly great things can happen. Applied properly using a strategic approach, AI solutions are capable of creating an enhanced and more personalised talent acquisition process. 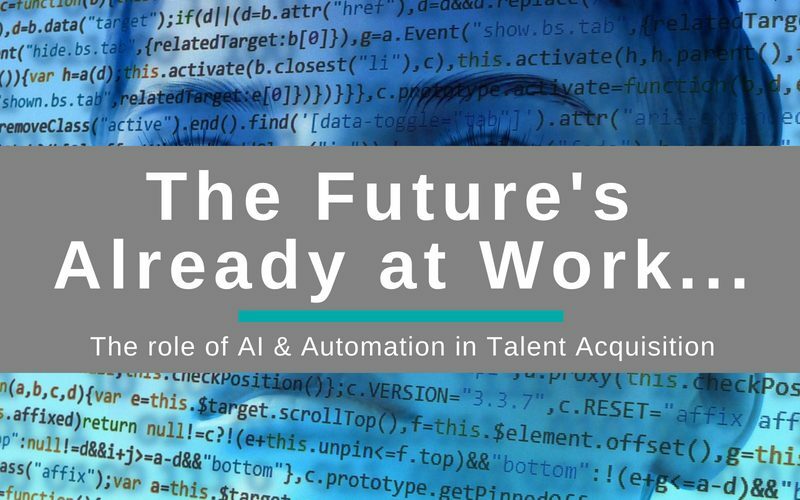 A valuable tool that enables HR and recruitment professionals to automate the more time-consuming aspects of talent spotting; AI is already improving the candidate recruitment experience and mobilisation process for many organisations. Instead, these technologies are now seen as a very effective way of freeing up HR professionals from the more mundane repetitive tasks that can be automated. Essentially, they give your team more time to engage in candidate conversations and build lasting relationships. This adds value to the sourcing and selection process. In other words, realising a better talent acquisition experience for all. Let’s consider the use of AI and automation technology to spot talent. Today, applicant tracking software (ATS) can significantly reduce the amount of time a talent acquisition consultant spends posting jobs and sifting through CVs. Whilst software solutions are busy in the background automatically sharing job adverts via job boards, matching candidates based on specific keywords, scheduling interviews and authorising job offers, you can afford the time to really get to know the candidate. What motivates them, what are their identifiable personality traits, and how would they fit within a team? Essentially, it enables you to gain a more rounded perception of talent. In addition to solving a candidate volume problem, AI and automation can prevent a pattern of poorly matched job applicants in the first place. CV selection with an AI layer means that you can discover what a successful employee in a specific position has done and look for candidates with backgrounds that emulate the top performers within your organisation. The result, of course, is a much better outcome for your hiring manager and your company in terms of candidate fit. But how does this all affect the overall candidate experience? On the face of it, automation and selection based on an algorithm seems cold and void of emotion. But, if the candidate journey is mapped carefully, automation can significantly boost candidate engagement through improved candidate-employer communications. As a candidate, it can be incredibly frustrating not receiving timely updates about an application. This can derail the candidate experience as well as negatively impact your company’s brand. Using automation, much of the improved candidate communication takes place in real-time. AI enables better candidate engagement through carefully planned hiring notifications. For example, workforce management software such as Oracle PeopleSoft and Workday offer ‘chatbots’ to resolve typical queries that candidates may have about a vacancy. And because your hiring manager is less consumed with handling the early-stage enquires, they have more time to invest in each candidate as an individual, as they progress through the hiring process. Even for the most experienced HR professional, there’s always going to be an element of objectivity when it comes to short-listing. AI is not challenged by this in the same way that we are. That’s not to say that AI alone can meet the challenge of talent management. It does, however, mean that it can help you make informed unbiased decisions. According to findings from LinkedIn’s 2018 Global Trends Report, companies recognise the value in being diverse, with 78% of companies prioritising diversity to improve culture and 62% doing so to improve company performance. Yet diversity, or lack of it, is still a stumbling block for many organisations. What we are seeing is an upward trend in hiring managers using automation technology to reduce the likelihood of bias, better identify and screen candidates and help close the diversity gap. Of course, AI and automation can only help close this gap as long as the data it is relying on is free from human bias in the first place. Your biggest challenge will therefore be the scope of your own data. In an ideal world, you would be able to compare your employee data against that of your competitors to identify top talent, but because you are tracking it internally, you are limited in making like-for-like comparisons against your own staff. This narrow field of data collection means that you do have to think realistically about any particular findings, but there are lots of ways this can be addressed. Automation and AI certainly help narrow the volume of applications, providing you with a rich pool of candidates to choose from. But, you still need to be realistic. You may have a top performer who ticks every box in the algorithm, but what if they don’t fit in with the team? What if they have strong views which could be in contrast to your brand values? These factors are vital for any HR team to know and to act upon but would be near impossible to track via automation. Consider a scenario where the data indicates that a potential client is a suitable match in many areas but is showing weakness in just one or two – perhaps because their CV did not contain specific keywords. By tailoring your interview questions to ask them about those areas, you can establish a much more complete picture of any underlying weaknesses, or strengths. What we are now seeing is acceptance that AI isn’t a replacement for the human side of human resources but is something that can be used as evidence to support traditional ‘instinct’. For further guidance on selecting talent acquisition or applicant tracking software to meet your business needs, contact the Silver Cloud HR team today.